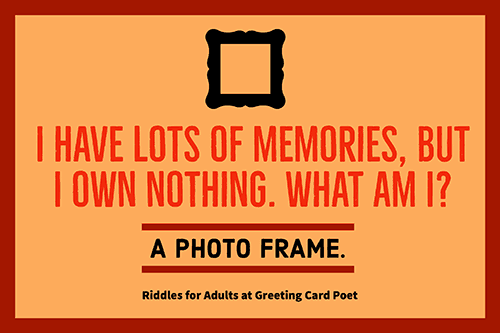 If you’re solving riddles for adults, we know you’re probably a kid at heart. Apart from being entertained, riddles, especially difficult ones, are very beneficial in many ways. Riddles not only improve vocabulary and fuel reading comprehension, but they also allow the opportunity for us to think outside of the box and work wonders for the development of the mind. This is because they force you to problem-solve and think critically which helps stimulate your brain and reduce the risk of memory loss later on. 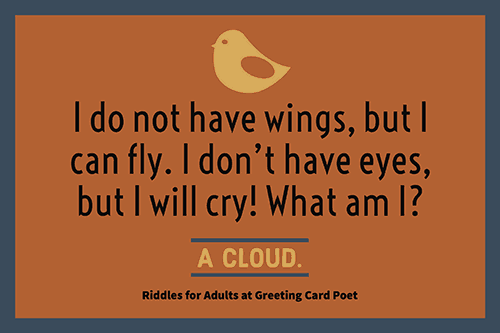 Have fun rattling your brain and trying to crack these riddles with answers! Because they all have rings. What did the smelly feet and smelly shoes say to each before going to a long day walking? I am a beer yet kids can drink me and not get drunk. What am I? What is the thing that you must give before you keep? What do a dollar and the moon have in common? People knead me to buy anything. 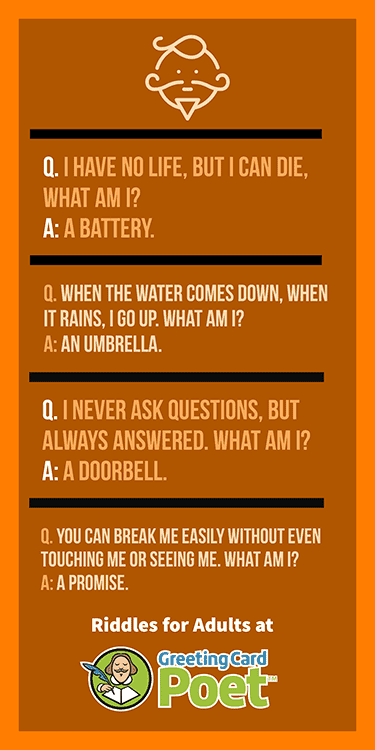 Tip: Try out some of these riddles before a brainstorming meeting to get folks thinking outside of the box. What vegetable is the king of rock and roll? What did Roger Rabbit give to Jessica Rabbit when they were married? What did the doctor prescribe to the sick lemon? What’s a plumber’s favorite song? Which travels faster? Hot or Cold? Hot is faster because you can catch a cold. I am a word. If you pronounce me correctly, it will be wrong. If you pronounce me wrong it is right? What word am I? I do not have wings, but I can fly. I don’t have eyes, but I will cry! What am I? I do not speak, cannot hear or speak anything, but I will always tell the truth. What am I? I have lots of memories, but I own nothing. What am I? Tip: These brain teasers can be used as an icebreaker prior to a brainstorming session in a work environment. What gets shorter when you add two letters to it? What is something that is yours but is used more by people you know? A man is found dead in an alley with a dagger plunged into his hear. The only evidence as to what occurred is an overturned table and 52 bicycles. What happened to the man? Killed in a card game. (Bicycle is a brand of playing cards, and 52 cards in a deck). Well, we hope you enjoyed these riddles and got the answers you needed! Most times, hard riddles have very simple answers. So if you managed to figure some of these out, we congratulate you! Frequently, inspiration can come to you light a light bulb going off in your head. Other times, you may just be stumped. Continue to sharpen your mind sharp and have fun solving more of our riddles to come! 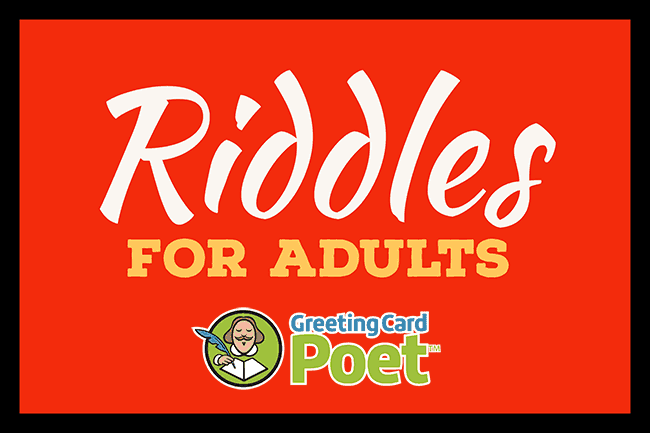 You’re on Riddles for Adults page.